(Brandon Griggs@CNN) We're all doodlers by nature. Give most people a pen, paper and some down time, and they'll fill the margins with the fruits of their imagination. But imagine if you could wave a pen in the air and create a three-dimensional rendering: A toy, a sculpture, a crude architectural model. Soon you will. 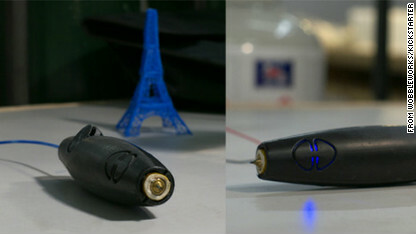 A Boston-based startup, WobbleWorks, has created what they are calling the world's first 3-D printing pen. It's called the 3Doodler, and it's been a sensation on Kickstarter, the crowdfunding site, since it debuted there Tuesday morning. The makers of the 3Doodler set a modest fundraising goal of $30,000; within 48 hours, backers had pledged more than $1.1 million. "We knew it was a great product. But we didn't expect the response to be this fast," said Daniel Cowen, a spokesman for the gadget, which is still a prototype. "The velocity of the response caught us by surprise. It's phenomenal." The 3Doodler plugs into an electrical outlet and works sort of like a glue gun. As the pen draws, it oozes heated plastic, which quickly cools and solidifies, allowing its user to build an infinite variety of patterns and shapes. Its makers say it works on surfaces or in the air. Users load spaghetti-like strands of non-toxic ABS plastic - the same stuff that's in 3-D printers - into the back of the pen. (A biogradeable form of plastic made from corn is also available.) The 3Doodler's makers say each one-foot strand of plastic, available in a wide range of colors, can produce about 11 feet of moldable material. WobbleWorks sees the 3Doodler as a simple and affordable form of 3-D printing, an emerging form of manufacturing that uses computer models to help machines build plastic objects. The MakerBot Replicator 2, perhaps the best-known 3-D printer for the home, costs $2,200. Cowen said they expect to sell the 3Doodler for $75, which includes a small bag of plastic strands. Additional 1kg spools of plastic will be available from a variety of sources for $30 to $55, WobbleWorks says. The pen's makers say the average 1kg spool of 3mm ABS plastic will supply roughly 4,000 feet of 3Doodling, or about the height of three Empire State Buildings. The gadget is shaping up to be a hit for WobbleWorks, a small toy and robotics company led by computer engineers Peter Dilworth and Maxwell Bogue. If manufacturing goes according to schedule, the first buyers will receive their 3Doodlers in September, Cowen said. Buyers who order now won't receive the pen until November, he said. The makers of 3Doodler have been collaborating with wire artists on Etsy, the crafts website, to show how the pen can be used to create artwork, jewelry and other objects. "We really want to create a community around 3Doodler," Cowen said. With more than 13,000 financial backers already on Kickstarter, they may already have.